Jeff Heeg’s 25-year career in ceramics has brought him to the Reitz Ranch Center for Ceramic Arts as the new artist in residence. He is a former studio assistant at Frasca/Strecker studios in Cincinnati, Ohio and Lexington, Kentucky for 4 years. He began working as an independent studio artist in early 2007. Jeff relocated to Arizona and was Julius Forzano’s classroom assistant at the Mesa Art Center for 4 years, after which he became an Resident Artist at Reitz Ranch. He is excited to be working alongside the members and students of the Ranch. Dexter Woods is a first generation ceramicist from Dallas, Texas. He graduated from TTU in 2014, where he studied under Von Venhuizen, his mentor and a “technical master” and Juan Granados, who taught the importance of a exploring a personal narrative through art. During his studies, Woods became connected to the legacy and meaning of Don Reitz’s work via Von Venhuizen, who had a deep friendship with Mr. Reitz spanning many years. Dexter’s teaching experience took a professional turn when he moved to Phoenix in 2015 and worked as an instructor at a private studio. He then helped to open, manage and operate a brand new studio in downtown Phoenix while holding classes in wheel throwing. In Dexter’s words; “Art is my outlet, to try to understand the world and myself. I love exploring form through clay and reaching for the limits of it’s memory. The first time I touched clay, it did exactly what I wanted it to do and I realized the limitlessness of the medium. Dexter will be teaching and working with atmospheric firing at the Reitz Ranch wood and salt/soda kilns, as well as helping in developing various programs at the ranch. Dexter teaches our Handbuilding Class on Monday mornings. Ben Roti is a ceramic artist originally from Spirit Lake, IA. He attended the University of Iowa in Iowa City, IA, from 2006 to 2010 and graduated with a Bachelor of Fine Arts degree in Ceramics. 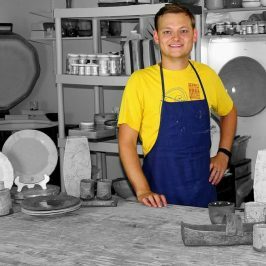 During college, Ben’s ceramic work concentrated on the elements of world conflict culminating in his BFA show, “The Cost of War.” After finishing his BFA, Ben accepted a position as a studio assistant to the ceramic artist, Don Reitz in Clarkdale, Arizona. Over several years (2010-2014), Ben had the opportunity to work with Don Reitz in the studio, assist with workshops in Montana and Florida, and was instrumental in the installations of gallery shows in Chicago, Denver, and Kansas City. At the Reitz Ranch, Ben furthered his knowledge in atmospheric firing with wood and salt types as well as a soda kiln in St. Petersburg, FL. He also was a part of constructing and repairing kilns. Ben worked with the renowned Don Reitz and is currently part of the team building an arts program at the Reitz Ranch including workshops and classes. Ben teaches our Wheel Class on Wednesdays. Mike Upp studied ceramics at Arizona State in the 1970’s. After graduation, he developed his first studio in an old tobacco barn in an artist community on 300 acres in the hills of northern Tennessee. He was a dedicated student of the art form and produced functional pottery for a wide variety of markets for over 10 years. He exhibited at all the major art shows at the time, as well as winning numerous awards at these events in; Ann Arbor, Michigan, Asheville, North Carolina, Gold Coast Chicago, Illinois, Washington, DC, Nashville, Tennessee and the major shows in Florida. He taught a number of classes and workshops at Arrowmont School and the Nashville Clay Center. After a number of years developing his craft, he moved back to Phoenix and joined a cooperative ceramic’s studio. During this time, he became the Executive Director of the Tempe Art Festivals, where the fall festival was consistently attended by over 250,000 attendees as well as had 350 artists and 9 stages of entertainment. Mike teaches our Glazing Workshop Class.